In an article on cn|2 Politics today, Senator Mitch McConnell is crediting The Money as the reason Thomas Massie crushed his northern Kentucky GOP establishment opponents in the May 22nd KY-4 GOP congressional primary. So, senator McConnell isn’t crediting the TEA Party, the liberty movement, and the rock solid Republican voting base that’s fed up with career politicians who run as conservatives and then vote for taxpayer funded Wall Street bailouts, even though those are the reasons that Thomas Massie credited in his victory speech? I’m not surprised, but I’m unsure whether senator McConnell is saying this because he’s trying to dump cold water on the constitutional conservative brush fires that are popping up all over Kentucky, or whether his message is intended to reassure himself after senator Rand Paul defeated establishment candidate Trey Grayson in a Randslide (Grayson was McConnell’s hand picked replacement for senator Bunning) and Thomas Massie just crushed the best the establishment GOP could throw at him, earning more votes than Webb-Edgington and Moore combined. For those just tuning in, Senator McConnell not only voted for the unconstitutional and obviously not conservative TARP-1 bailout of Wall Street, he also twisted the arms of Republicans in Congress or it wouldn’t have passed. McConnell’s top five campaign contributors that year were big financial interests that stood to gain plenty by privatizing their unearned profits and then nationalizing their well earned losses onto the backs of hard working tax payers and their children who were sold into debt slavery by the Bankster Bailout. There is a HUGE difference between the Wall Street bankster money that funds Mitch McConnell’s campaigns and the money from individuals that funded Rand Paul and Thomas Massie. We the People contributed money to take back our country from the wolves that fund most political campaigns, and thus own most politicians. Thomas Massie didn’t win because of money. Sure, money is needed to fend off the vicious lies from the desperate establishment party candidates in the primary, but Kentuckians voted for Thomas Massie because he isn’t an establishment hack who puts himself above everything else and his party ahead of his nation, while shunning our Constitution after swearing an oath to defend it. Mitch McConnell, the Senate Minority Leader, lost 14% of the vote in the 2008 Republican primary to a truck driver who spent so little money that his campaign website was a free hosting site with annoying popup banner advertisements compelling us to “Meet Russian women for friendship or marriage”. That 14% was the “anyone but McConnell” vote in 2008, and Kentuckians are MUCH more awake now. Senator McConnell’s establishment colleague and mostly silent partner in the US Senate, Bob Bennett, was defeated by TEA Party candidate Mike Lee in Utah in 2010. In fact, Bennett, the incumbent with very strong establishment support, was eliminated early in the state convention ballot process, finishing third. That’s something for conservatives in Kentucky to think about as we all look forward to the 2014 election, when the real conservative activists are going to be out in force. 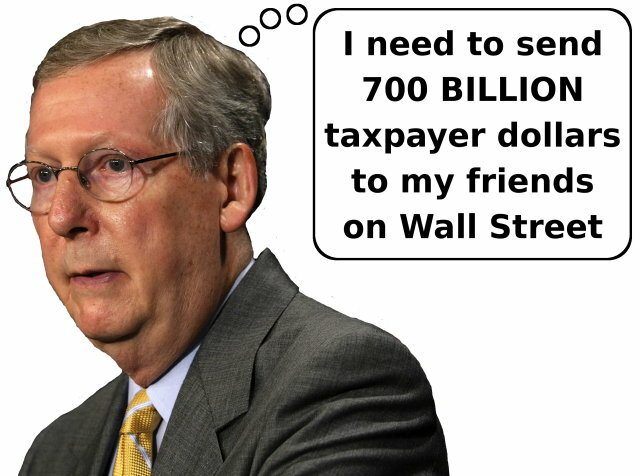 Hey, Mitch… remember THIS? Kentucky voters not only remember the TARP-1 Bankster Bailout betrayal, but more and more are learning about it all the time. That issue is not going away because it symbolizes all that’s wrong in Washington DC, and We the People mean to change that. We are changing it. One election at a time. Best of luck to Thomas Massie, swimming with the sharks in DC. Go with our extreme gratitude for your sacrifice. You’re too nice a guy for such a fate. Anon 1:48- I’m in the process of writing something up on Rand’s endorsement of Romney. However, I do find it laughable you compared him to Mitchy Boy. Mitch wishes he was as smart and crafty as Rand. I trust Thomas like a brother. looks like Rand has joined the likes of Mitch. Endorsing Romney? What of your superstar now? It wouldn’t have mattered how much money was dumped into the Massie campaign has his platform not resonated with the voters. Money is necessary but not the deciding factor. I understand it takes about $20 million to run a Senatorial campaign. This mind-numbing number should focus our minds on those candidates who can afford to run against Mitch and/or the ability to get that kind of support. So, how about contacting Liberty for All and see what they can do for us in Kentucky’s next Senatorial campaign? If we thought we had some significant backing, I bet we could find some good candidates. And, btw, who is running against Mitch in 2014? Let’s get ‘er started! I agree Dale–McConnell is totally sold out and voting against the people. I will vote against him in 2014 regardless of who runs. Right on! The TEA Party needs to put up a strong candidate to beat McConnell in his next primary election. I would have voted against McConnell in his last two elections if the Democrats would have put up a pro-life candidate. McConnell must go! Get real Mica. If it wasn’t about the money then the other 8 “tea party” candidates would have won instead of getting crushed. The facts are the tea party is a good thing for Kentucky and the US. But you must call them the way they are. The “liberty” folks here in Kentucky throw labels around on people and most of them are undeserved. Its ridiculous.